Patrick Higby was born at the U.S. Air Force Hospital in Wiesbaden, West Germany. He was commissioned a 2d Lt in the U.S. Air Force through the Air Force ROTC program at Georgia Institute of Technology in Atlanta, Georgia, and went on active duty beginning April 17, 1989. His first assignment was as a Squadron Section Executive Officer with the 6940th Electronic Security Wing at Fort Meade, Maryland, from April 1989 to January 1990, followed by service as a Project Officer for Special Signals Intelligence Collection with the National Security Agency as well as a Flight Commander with the 29th Intelligence Squadron at Fort Meade from January 1990 to August 1994. Captain Higby served as a Milstar Communications System Engineer with the 4th Space Operations Squadron at Falcon AFB, Colorado, from August 1994 to March 1995, and then as Chief of the Milstar Communications Analysis Flight with the 4th Space Operations Squadron at Falcon from March 1995 to June 1996. 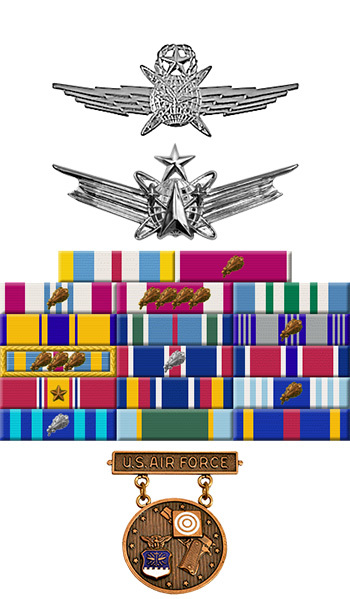 His next assignment was as C4 (Command and Control, Communications, and Computers) Architecture and Integration Officer, and then Executive Officer with the Directorate of Communication and Information at Headquarters Air Force Space Command at Peterson AFB, Colorado, from June 1996 to June 1998. He served as Flight Commander for the Information Systems Flight with the 15th Communications Squadron at Hickam AFB, Hawaii, from June 1998 to July 1999, followed by Naval War College at Newport, Rhode Island, from August 1999 to June 2000. 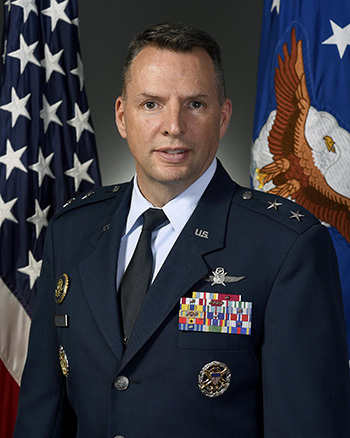 Lieutenant Colonel Higby served as Commander of the 786th Communications Squadron at Ramstein AB, Germany, from June 2000 to July 2002, and then as Space Systems Action Officer with the Directorate of Communication and Information on the Joint Staff at the Pentagon from August 2002 to July 2004. He attended Air War College at Maxwell AFB, Alabama, from July 2004 to June 2005, and then served as Chief of the Network Systems Division in the Directorate of Communications and Information with Headquarters Air Combat Command at Langley AFB, Virginia, from July 2005 to April 2007. Colonel Higby's next assignment was as Commander of the 78th Mission Support Group at Robins AFB, Georgia, from April 2007 to April 2009, followed by service as Commander of the 75th Air Base Wing at Hill AFB, Utah, from April 2009 to June 2011. General Higby served as Deputy Commander of the White House Communications Agency at Joint Base Anacostia-Bolling, Washington, D.C., from June 2011 to July 2013, and he has served as Commander of the 81st Training Wing at Keesler AFB, Mississippi, since August 2013. General Higby was awarded the Bundeswehr Sch�tzenschnur (German Armed Forces Badge for Weapons Proficiency) in Gold in 2001 and the Excellence in Competition Medal and Top Gun Award in 2009. During his service in the Air Force, General Higby has made deployments with the Federal Bureau of Investigation, Customs Service, Central Intelligence Agency, US Navy aboard the dock landing ship USS Mount Vernon (LSD-39), U.S. Army with the 224th Military Intelligence Battalion, Royal Australian Navy aboard the oiler HMAS Westralia (O 195), and German Navy aboard the replenishment ship FGS Saarburg (A1415). He received his Bachelor's Degree in Electrical Engineering with a Minor in German from Georgia Institute of Technology in 1988, and a Master of Science in Electrical Engineering from Colorado Technical University in Colorado Springs in 1996.